So OPUS JAY in Hongkong is well and truly over! Mr Chou conquered not just the fans' hearts but warded off a super typhoon and left with some exciting promises! After my experience following his three concerts in Taipei, I was pretty hyped-up about keeping track of nine in Hongkong. Not just the fans in Hongkong, but fans in Singapore, Malaysia, Taiwan and everywhere else as the news, pics and vids went out online via weibo and Facebook. I survived the marathon run of nine concerts, thanks to many other Jay fans from Hongkong, Taiwan and Malaysia who were totally on-the-ball and up to the minute and second with the news from weibo. I had to constantly refresh my Facebook News Feed and after a while, it became a simple matter to pick out the best updates and translate them into English for my Page. Together with trying my best to keep this blog updated and watching vids early in the morning before heading to work, sleep deprivation was de rigeur but oh-so-rewarding. I was really getting by on adrenaline and endorphins for the past week! And what else can I say but that Jay was ABSOLUTELY AMAZING for all the concerts! I was so glad to see that his health was much better and he appeared so much more relaxed in Hongkong, in contrast to Taipei, where he admitted he felt more stressed out in, due to the high expectations of the home crowd. Note that he had also just recovered from his bout of illnesses then. 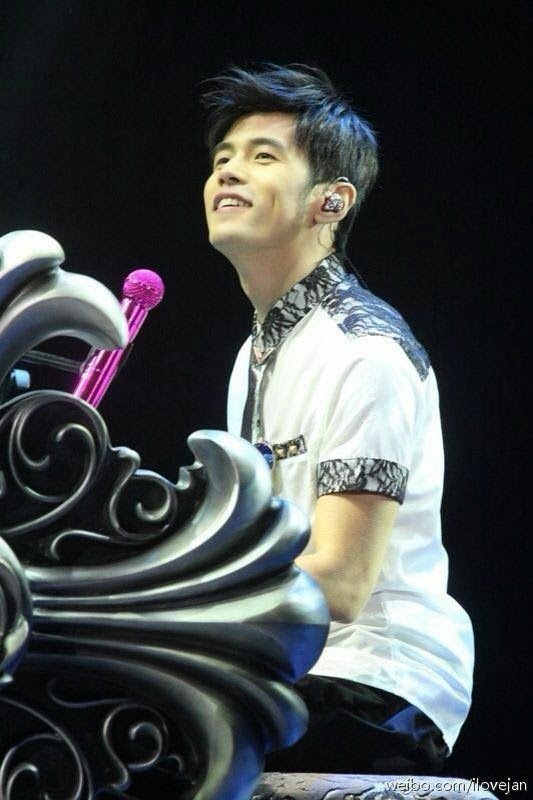 In the Hongkong Coliseum, however, his energy levels never let up for each and every concert as he sang, danced, played the piano and guitar, showed off his fabulous abs, bantered with the fans and his guests and posed for numerous photos backstage. The fans, in return, never let up on their level of enthusiasm and fervour and of course, what made the atmosphere in the Coliseum even more special was the configuration of the arena and the stage, where the audience up front was all standing very close to the stage in a rock zone. Oh...how I wish we had been able to do that in the Singapore Indoor Stadium for his concerts in June! Before I go on, here is one of my absolute fave pics from OPUS JAY, which I absolutely MUST post for you to swoon over....just look at that joyful smile and that DIMPLE!!!! Oh..the hair is perfect too and I just love that smart white-and-grey shirt! My dear Jay-fan-friend casually WhatsApped it to me last night just before I was about to turn in. And when I checked it, I was blown away! Of course I could not go to sleep straight away after that because I had to Share it on my Page and Tag as many people as I could! One thing I have to mention here was the favourite activity of the fans on Facebook during those ten days or so viz The Great Guess-The-Guest Game...lol! Yup, it was totally expected that Jay would have special guests every night but the only question was who. As such, there were games going on with prizes even being dished out to those who guessed correctly. Nah...I did not take part in any but did have discussions with friends and I did get two (or three) correct. Yes, I said Eason Chan and Kenny Bee would appear. And Grasshopper was on my mind as well, although I somehow did not think Jay would. Of course I was delighted when I saw them! They are a fantastically fun bunch! Donnie Yen and the Young And Dangerous cast were the best surprises. So was Joey Yung, as I love the song which Jay wrote for her (xiao xiao). I am not that familiar with Julian Cheung Chilam but I can see why Jay got him as the first guest, as the Cantonese song Jay performed was taken from his TV series. I am also not familiar with Kelly Chen but their performance was nonetheless memorable. 9. Jay's obvious pleasure and passion in performing and interacting with his guests and fans coupled with his natural humour, which made for great entertainment. 10. Jay pushing forward the final concert from the night to the afternoon in order to beat the typhoon, making him the first Taiwanese artiste to do so. That meant he and the crew could only have a short break after Show No 8 on Saturday night. But it looked like they were none the worse for that! "Eason would not tell me which show he was attending as he wanted to surprise me. We communicated on WhatsApp and he sang a line from that song, Sui Yue Ru Ge. I said that's very good; I won't dare to sing that! I also invited Anthony Wong to sing with me but he declined saying he was too old and preferred to be in the audience. Nine shows have gone by so quickly. I'm happy yet feel sorry as I will miss the feeling. As such, I am considering whether to return for another concert. I'm not sure if I can return home tomorrow (because of Usagi), and even if I can't, it's okay. I'll go out and about here." Of course the reporters just HAD to throw in a query about Hannah and Jay replied coolly with "I don't know'' as his staff quickly brought the interview to an end. "I had practised his (Eason) song and if he did not sing with me, it would not be perfect. I also got my mother to hug him and got him to sing two songs. My one regret is that Eric Tsang was too busy and had no time to practise and so declined to be my guest. I really wanted to sing Ju Hua Tai with him. Perhaps I'll meet up with him for supper. There was also another interview in which he said he was considering an album of Cantonese songs! I really hope he will! And he wants to have another round of concerts in Hongkong?? What will he be up to next?? Do Share the Page with more of your friends who love Jay or want to know more about him, especially those who don't understand Chinese. That is why I post and write in English. As for an OPUS JAY encore in Singapore, there is a chance that it could happen. Keep watching the Page and this blog. And do join the official fanclub for more immediate access to information about Jay's concerts and other things. 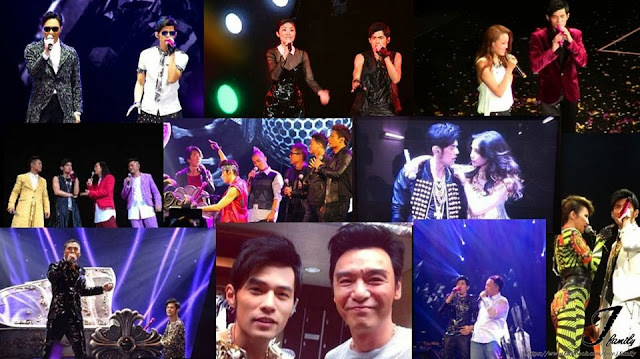 Search for Jay Chou Singapore and Malaysia on Facebook and message the admin.